Background: Cholinesterase determination indicates whether the person has been under pesticide exposure is not. It is recommended that the worker's cholinesterase level should be assessed for workers at a pesticide applied region. Hence, cholinesterase activities in blood samples of agricultural workers exposed to vegetables and grape cultivation with age matched, unexposed workers, who never had any exposure to pesticides, were estimated. Methods: The detailed occupational history and lifestyle characters were obtained by questionnaire. Cholinesterase activity was determined by the method of Ellman as modified by Chambers and Chambers. Results: AChE was ranging from 1.65 to 3.54μmoles/min/ml in exposed subjects where as it was ranged from 2.22 to 3.51μmoles/min/ml in control subjects. BChE activity was ranging from 0.16 to 5.2μmoles/min/ml among exposed subjects, where as it was ranged from 2.19 to 5.06μmoles/min/ml in control subjects. The results showed statistically significant reduction in enzyme activities (AChE 14%; BChE 56%) among exposed subjects. Conclusion: It was concluded that the reduction in cholinesterase activity may lead to varieties of effects. Hence it is compulsory to use protective gadgets during pesticide spray. Further a continuous biomonitoring study is recommended to assess pesticide exposure. ChE determination indicates whether the person has been under pesticide exposure or not. It is recommended that the worker's ChE level should be assessed before they start working at a pesticide applied region. In view of this, the present study was aimed to evaluate the AChE and BChE activities among agriculture workers occupationally exposed to pesticide. The study was conducted in the neighboring villages of Chikkaballapur town, rural Bangalore, South India, from December 2010 to March 2011. This study included 28 rural people who were agriculture workers, engaged in floriculture, and cultivation of cabbage, potato, and grape. A control group consisting of 13 unexposed workers, who never had any exposure to OP pesticides, was taken as the reference group. A detailed history, including the personal and occupational details, was recorded through a questionnaire. The list of pesticides used and the frequency of usages were also investigated. Ethical clearance was obtained from Institute Ethical Committee. A written informed consent was taken from all study subjects after explaining the importance of the study in their local language. Five milliliters of venous blood was collected in dried heparinized tubes and transported in ice box to the laboratory. Blood samples of voluntarily participated agriculture workers (n = 28) who have been involved mainly in pesticide spraying activities in vegetable and grape gardens were collected. A control group consisting of 13 male subjects who belonged to a similar age group and socioeconomic status and were not exposed to any kind of pesticides was selected for the study from the same localities. Blood was centrifuged at 4000 rpm for 10 min at 4°C to separate the plasma. ChE activity was determined by the method of Ellman et al. as modified by Chambers and Chambers. Three milliliters of 0.25 mM of 5',5'-dithiobis (2-nitrobenzoic acid) (DTNB) prepared in 0.05 M phosphate buffer was pipetted out into a cuvette, in which 20 μl of thoroughly mixed plasma sample and 100 μl of 1 mM substrate (acetylthiocholine iodide for AChE assay) were added. The contents were mixed gently and allowed to stabilize for 60 sec. The sample was placed on a UV-VIS spectrophotometer set at a wavelength of 410 nm. The change in absorbance with a light path of 1 cm width was recorded following time drive kinetic spectrophotometric method for 5 min to ensure that the linear phase of the reaction was measured at a time lag of 30 sec. All samples were assayed in duplicate. A nonenzymatic blank was included to assess the background levels of hydrolysis of the substrate. Same procedure was repeated for BChE assay using butyrylthiocholine iodide as substrate. ChE activities were expressed in μmoles/min/ml of plasma. Student's t-test was used to compare the significance of the mean differences in ChE activity between exposed and control subjects. The values of P < 0.05 were considered significant. 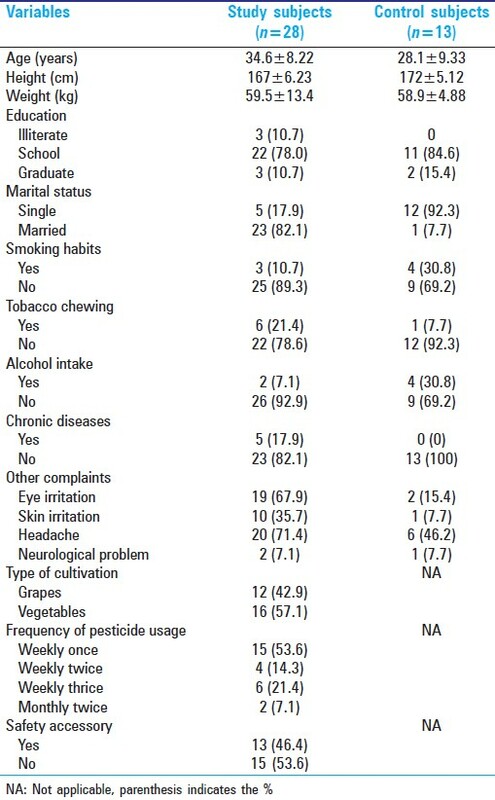 The demographic data of lifestyle habits, type of crop cultivation, pesticides used, and frequency of application collected on both exposed and control subjects are summarized in [Table 1]. The average age of exposed subjects and controls were 34.6 ± 8.22 and 28.1 ± 9.33 years, respectively. About 53.6% of study subjects were using pesticides weekly once and 21.4% were using weekly thrice for their crop protection. The majority of the workers did not use any protective equipment and a normal cloth was used to cover their face as a mask while spraying. About 68-71% had complained having the symptoms of headache and eye irritation [Table 1]. 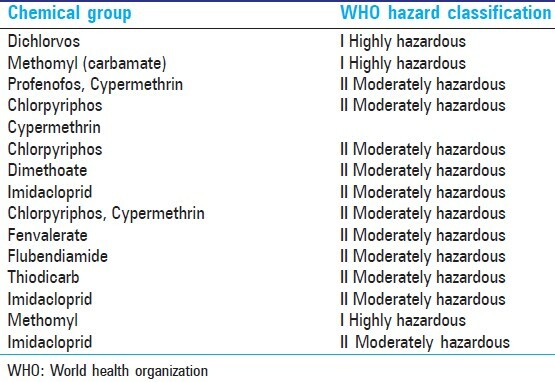 [Table 2] shows the list of commonly used pesticides in the study locations and World Health Organization (WHO) classification. These data were collected in the local market and from the farmer. Majority of the pesticides used were in the categories of moderately hazardous to highly hazardous. Pesticides used were in the chemical group of OP, organochlorine, carbamates, and synthetic pyrethroids. AChE and BChE activities measured in the blood plasma of exposed and control subjects are given in [Table 3]. AChE activity among exposed subjects ranged between 1.65 and 3.54 μmoles/min/ml, with a mean concentration of 2.51 μmoles/min/ml, whereas in the control group it ranged between 2.22 and 3.51 μmoles/min/ml. The BChE activity in agricultural workers ranged between 0.16 and 5.2 μmoles/min/ml, with a mean concentration of 1.66 μmoles/min/ml, whereas in the control group it was 2.19-5.06 μmoles/min/ml, with a mean concentration of 3.87 μmoles/min/ml (P < 0.05). 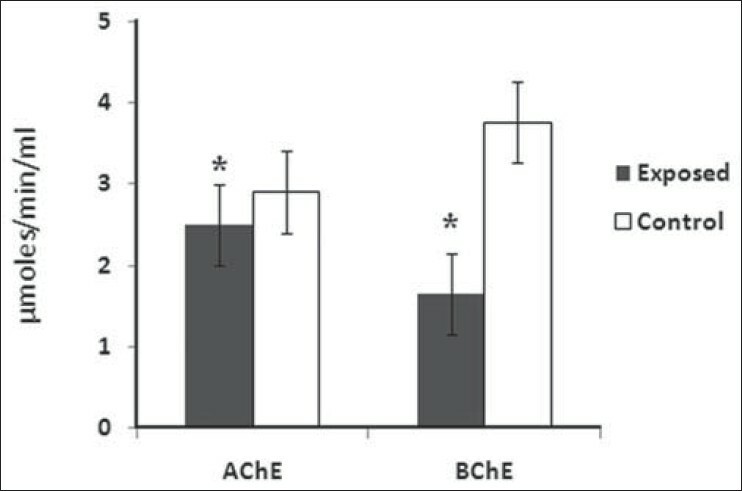 The measured levels of AChE and BChE activities in exposed subjects were comparatively less than in the control subjects [Figure 1]. The use of ChE inhibiting pesticides in the agricultural activity caused the depletion of AChE and BChE activities among workers. From earlier reports and the present results, it can be speculated that decreased plasma ChE activity is due to prolonged exposures to OP pesticides among the study subjects as compared to controls [Figure 1]. This study was carried out as part of the academic dissertation and a large number of people could not be included. However, the data generated highlights the effects of pesticide exposures and it would help conduct further studies. The AChE and BChE activities measured were significantly lesser due to multiple exposures to different groups of pesticides used for agricultural activity. Unscientific way of pesticide mixing, improper way of handling pesticides, and entering agriculture field immediately after pesticide application play significant roles in reducing plasma ChE activity. Preventive measures coupled with biomonitoring of pesticide exposure using ChE inhibition as a marker are very much important. This will create awareness among the agriculturists, pesticide manufacturers, agriculture department, etc. We thank the Director, NIOH, Ahmedabad, for extending constant support. We would like to acknowledge all staff of ROCH (S) for their help. The support and participation of the villagers is greatly appreciated. 1. Kumari B, Kumar R, Madan VK, Singh R, Singh J, Kathpal TS. Magnitude of pesticidal contamination in winter vegetables from Hilsar, Haryana. Environ Monitor Assess 2002;87:311-8. 2. Mileson BE, Chambers JE, Chen WL. Common mechanism of toxicity: A case study of organophosphorus pesticides. Toxicol Sci 1998;41:8-20. 3. Oakeshott JG, Devonshire AL, Claudianos C, Sutherland TD, Horne I, Campbell PM, et al. Comparing the organophosphorous and carbamate insecticide resistance mutations in cholin- and carboxyl-esterases. Chem Biol Interact 2005;15:157-8. 4. Perera FP, Rauh V, Tsai WY, Kinney P, Camann D, Barr D, et al. Effects of transplacental exposure to environmental pollutants on birth outcomes in a multiethnic population Environ Health Perspect 2003;111:201-5. 5. Whyatt RM, Rauh V, Barr DB, Camann DE, Andrews HF, Garfinkel R, et al. Prenatal insecticide exposures and birth weight and length among an urban minority cohort. Environ Health Perspect 2004;112:1125-32. 6. Berkowitz GS, Wetmur JG, Birman-Deych E, Obel J, Lapinski RH, Godbold JH, et al. In utero pesticide exposure, maternal paraoxonase activity, and head circumference. Environ Health Perspect 2004;112:388. 7. Joshaghani HR, Ahmadi AR, Mansourian AR. Effects of occupational exposure in pesticide plant on workers' serum and erythrocyte cholinesterase activity. Int J Occup Med Environ Health 2007;20:381-5. 8. Eyer P. The role of oximes in the management of organophosphorous pesticide poisoning. Toxicol Rev 2003;22:165-90. 9. Mourad TA. Adverse impact of insecticide on the health of Palestinian farm workers in the Gaza strip: A haematologic biomarker study. Int J Occup Environ Health 2005;11:144-9. 10. Ellman FL, Courtney KD, Andreas V Jr, Featherstone RM. A new and rapid colorimetric determination of acetylcholinesterase activity. Biochem Pharmacol 1961; 7:88-95. 11. Chambers JE, Chambers HW. An investigation of acetylcholinesterase ibhibition and aging and choline acetyltransferease activity following a high level acute exposure to paraoxon. Pest Biochem Physiol 1989;33:125-31. 12. Vidyasagar J, Karunakar N, Reddy MS, Rajnarayana K, Surender T, Krishna DR. Oxidative stress and antioxidant status in acute organophosphorous insecticide poisoning. Indian J Pharmacol 2004;37:76-9. 13. Chakraborty S, Mukherjee S, Roychoudhury S, Siddique S, Lahiri T, Ray MR. Chronic Exposures to Cholinesterase-inhibiting Pesticides Adversely Affect Respiratory Health of Agricultural Workers in India. J Occup Health 2009;51:488-497. 14. Ames RG, Brown SK, Mengle DC, Kahn E, Stratton JW, Jackson RJ. Cholinesterase activity depression among California agricultural pesticide applicators. Am J Ind Med 1989;15:143-50. 15. Hillman JV. Emergency care of insecticide poisoning. J Florida Med Assoc 1994;81:750-2. 16. Clarke EK, Levy LS, Spurgeon A. The problems associated with pesticide use by irrigation workers in Ghana. Occup Med 1997;47: 301-8. 17. Misra UK, Prasad M, Pandey CM. A Study of cognitive functions and even related potentials following organophosphate exposure. Electromyogr Clin Neurophysiol 1994;34:197-203. 18. Lopez-Carillo L, Lopez-Cervantes M. Effect of exposure to organophosphate pesticides on serum cholinesterase levels. Arch Environ Health 1993;48:359-63.